The Foam Trainer™ is a practice ball that’s the size of a 12” softball, but made of super lightweight porous foam. 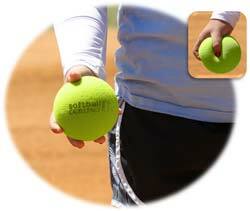 Lighter than a nerfball the Foam Trainer™ is designed to help your pitchers and throwers increase the strength of their throws, as well as learn to improve their control. Specifically designed with an extremely low mass, the Foam Trainer™ creates little resistance to air flow. The athlete must, therefore, learn to thrown very forcefully to generate distance. The Foam Trainer™ also responds to any slight change in hand direction at release – helping pitchers and throwers improve their control by showing them exactly where their hand was facing at release. Made from special, ultra-light foam, the Foam Trainer™ provides immediate feedback on hand direction at release – helping Pitchers and fielders improve their control. Foam Trainers also help pitchers and position players throw the ball faster as a direct result of their lack of weight and density. For advanced pitchers, the Foam Trainer™ will help improve the control and movement of their Roll-Over Drop by helping them turning their hands & wrist over instead of rolling over from the shoulder. Younger Players will benefit from using the Foam Trainer™ since their light weight will force players to catch with 2 hands. Get 3 online Foam Trainer drill video’s from Softball Excellence for FREE ($6.00 value) with purchase. Included in the Foam Trainer™ package are instructions and a special code to download the 3 free Foam Trainer video eDrills. Learn more about these free Foam Trainer eDrills.